I’m very excited to welcome Nikki as a guest contributor today. Nikki very kindly sent me one of these snowflake pillows, and I LOVE it! In the picture below you can see how great it looks in our white chair. She’s a very talented lady. I hope you enjoy her detailed tutorial about how to make your own hand-painted snowflake bolster pillow! Decorating for the holidays is one of my very favorite things. It’s a magical time of year. You can feel it in the air. Although I’m not a big fan of the cold, I love seeing the snowflakes fall. It’s really pretty to watch. Through the window. As I’m curled up inside, next to a fire. Sipping on something warm. Amiright? Each year I like to add new touches to our holiday decor. Unique items, special items. This Snowflake Bolster Pillow is one of those things. I love the cobalt blue color of the fabric against the glint and sparkle of the snowflakes. And the white pom pom trim puts it over the top. Oops, I’m getting ahead of myself! I should probably tell you who I am and what I’m doing here. LOL I’m Nikki from View From In Here and owner of the Make Lemonade Shop. Like most of you, I love to create my own home decor and holiday gifts. Jann has invited me by to show you how to create your own Handpainted Pillows. This post contains some affiliate links for your convenience. Which means if you make a purchase after clicking a link, I will earn a small commission. The great thing is, it won’t cost you a penny more! Click here to read my full disclosure policy. This Snowflake Bolster Pillow is fun to create. Make one for yourself and a few to give away. The cool thing about this pillow? You can make it any length you choose. Maybe get a little crazy and make a long and short one. Fabrics react differently when painted, depending on the composition and blend. The Indoor/Outdoor fabric used for this project creates the coolest effect. The paint fades into the material (100% Polyester) and resembles a real snowflake. I absolutely love it. You can use another type of fabric, just know the effect won’t be the same. This video shows you how to use the fabric paint with the stencils. And you can see the cool effect that occurs with the Indoor/Outdoor fabric. When I discovered that Freezer Paper could be used to create stencils, the heavens opened and the angels sang. A whole new world opened up. If you can cut a stencil, you can create cool decor items. Grab the snowflake graphics and print them out on 8.5 x 11 paper. There are several different patterns for you to choose from. I used 5 different stencils for this Snowflake Bolster. The variety of shapes and sizes was pleasing to me. Choose a combination you like. Then lay your snowflake graphic on the freezer paper and tape it down. Cut along the black lines of the snowflake to create the stencil. Each stencil can be used up to 3 times. Once you have your stencils cut out, place them on your fabric. Find a grouping you like. Press the stencils with a Medium-High heat iron. This adheres them to the fabric. Ensure that they are ironed down well. Place a large dollop of the White Fabric Paint on a palette, add a bit of water to thin. Blend together with a size 8 round brush. Begin painting the Snowflakes with a light coat of paint. The paint will soak into the fabric. Repeat this step several times. Choose areas that you would like to be more opaque. Add several more coats of white paint, until you get the effect you like. The snowflakes in photos 4 and 6, above, have only 2 coats of white paint. I wanted them to be more transparent. Doesn’t the blue, showing through in areas, make the snowflake look real? They look cold to me. <Brrrr> Perfect. When you have the white part of the snowflake painted to your liking, allow the paint to dry. Next, put some of the Diamond Glitter paint on your palette. Don’t dilute this paint with water. Use your brush and add it to your Snowflakes. Vary the amount of layers in different areas. I used 2 coats in some areas and 5 in others. Dry for 24 hours. When it’s completely dry, place a pressing cloth over the design and set the paint with an iron on high heat. Don’t these pom poms look like snowballs? Perfect for this Snowflake Bolster Pillow! Pin the pom pom trim to the short ends of the pillow front. Hand baste to secure. Then machine stitch the trim. Stitch 1/2 inch seam all the way around the bolster-leaving a 10 inch gap in center of the bottom for stuffing. After stitching, check the seam to ensure that the white trim isn’t showing. If so, restitch your seam at 3/4 inch. This is how the trim should look. The only thing showing is the pom poms and the strings, not the base. Zig-zag the seam for endurance, and to prevent raveling. Turn the pillowcase right side out. Use a chopstick (or other pointed object) to push out the corners, nice and crisp. Pin the seam closed with a double row of pins. Sew closed with a 1/2 inch seam. Whoo Hoo! It’s finished. 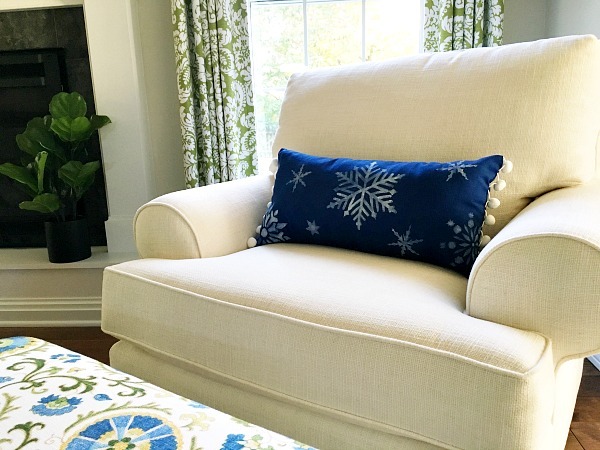 Isn’t it a gorgeous Snowflake Bolster Pillow? If you’re like me, cold and snow are not my favorite things. But I do like snow on Christmas Eve. As long as I have my slippers and a cup of hot cocoa. The weather outside might be frightful, but a fire is so delightful, and since we’ve no place to go…Let it snow, let it snow, let it snow. And if you don’t get any snow for Christmas this year, you have your Snowflake Bolster Pillow, right? Jann, thanks for having me. I hope that you all enjoy creating your own Snowflake Masterpiece. Happy Holidays. Jann, thanks so much for having me. I love the way the bolster looks in your home. It really pops against the white chair. I hope that your readers like the tutorial and make a “Let It Snow” bolster of their very own. The indoor/outdoor fabric looks really cool with the fabric paint, and the glitter tops it off! Nikki, thank you for the wonderful post and pillow! Glad to have you here! Love snowflakes and this pillow is just too adorable. I would use it all winter. Yes, this really is a great idea for all winter long!